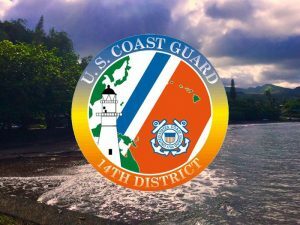 The Coast Guard with assistance from the Navy is searching for a fisherman reported overboard from a vessel 80 miles north of Hāna, Maui on Sunday afternoon. The crewmember reportedly fell overboard from the 68-foot Kawaiola fishing vessel sometime in the afternoon. A distress call was made at 5:11 p.m. indicating that the man was last seen on the deck of the vessel at 2:30 p.m. Later, the crew realized he was no longer aboard and made the call for help. The missing man is described as 5 feet 6 inches tall, weighing 130 pounds, and was last seen wearing jeans. The search includes a Hercules aircrew, a Navy Seahawk crew, and the Coast Guard Cutter Kittiwake was en-route and scheduled to conduct search patterns at first light. The weather on scene is reported as winds of 17 mph and seas of 5 feet.